Yomar Monsalve, my Michelin-starred new kitchen bestie, and I were back-and-forthing the other day about a dinner I was planning for his farewell from Livingstone, when he announced he’d bring along a “formula made from the magic sindambi for everyone to taste.” My Zambian assistant, Adelina Banda, later let on that sindambi was the Lozi word for rosella, the ubiquitous wild edible about which I wrote in July. So, no surprises there. I, on the other hand, was sure Yomar had never tasted the indigneous muchingachinga fruit, only because they weren’t in season. Back in May we’d juiced bucketfuls of the fruit, and frozen it to be used later in the year. Muchingachinga, which the British named the northern dwaba berry. 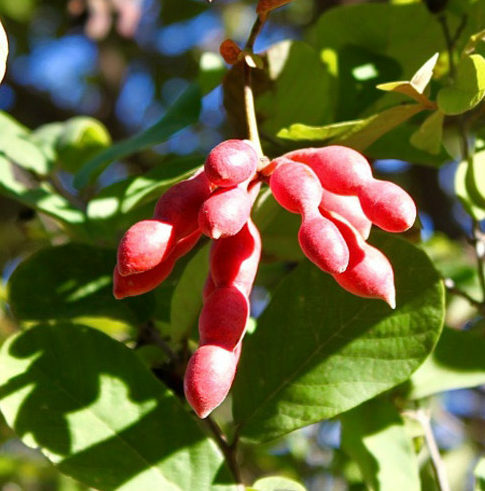 Muchingachinga, or northern dwaba berries, or monkey fingers –“Don’t call them that,” Chris wails, “it’s an awful name!”– are indigenous fruit on a diminutive tree that thrives in semi-arid Kalahari sand throughout southern Africa. The tree is, in fact, from the custard apple family, the Annonaceae, but doesn’t look or taste like any one I’ve seen before. The custard apples I came across in America were a frumpy dull-green, covered in cellulite. 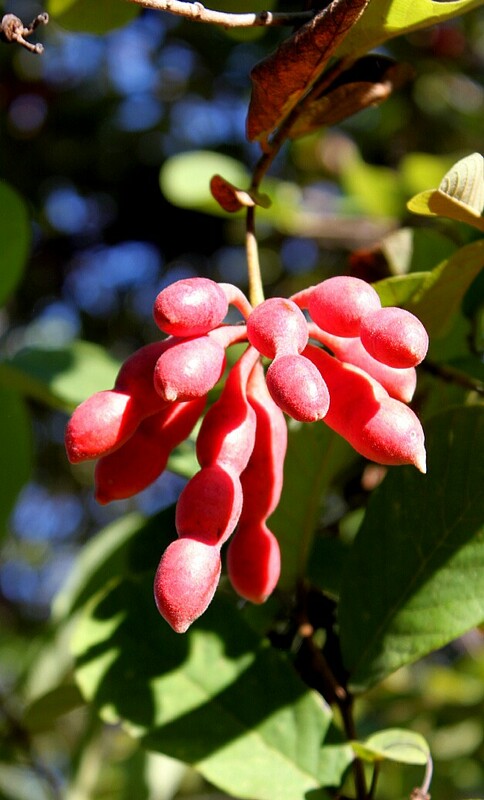 A muchingachinga fruit, in comparison, is like one of those envied sirens: too many curves clothed in bombshell red. With its sharp, almost-peppery taste and distinct scent, I guessed muchingachinga would make a perfect coulis. And how better to show off its bombshell red than to set it against the whitest of white dessert? I was considering vanilla ice cream until Chris’s sister, Dee, wrote to me about a sublime (green tea) panna cotta she’d just eaten in a restaurant in her home city of Melbourne in Australia. She induced a light-bulb moment: I’d serve the bombshell-red coulis with a virgin-white coconut panna cotta. 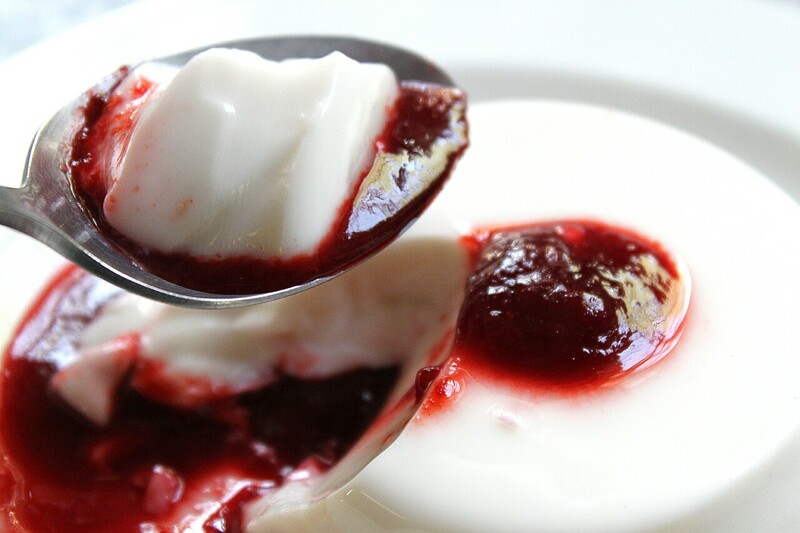 Coconut panna cotta could be complemented by any sharp wild fruit coulis. Wineberries, which grew around my property in Virginia, come to mind. 1. Soak the gelatin leaves in cold water for at least five minutes, or if using gelatin granules follow the product’s instructions because different brands can vary greatly. 2. Grease the insides of 12 ramekins with coconut oil. 3. Combine the coconut milk, milk, and sugar in a saucepan and bring to the boil, stirring regularly to dissolve the sugar. As soon as the mixture starts to bubble, remove from the heat. 4. Lift the softened gelatin out of the water and add to the milk mixture, ensuring it dissolves completely. 7. When ready to serve, turn the panna cotta ramekins out onto individual plates. (Running a small sharp knife around the edge of the ramekin will help to plop it out.) Garnish with the muchingachinga coulis. Footnote: When Yomar tasted the muchingachinga coulis his face lit up. “I’ve never tasted anything like it!” he beamed. (And let me tell you, he’s tasted stuff I wouldn’t dream of allowing past my lips.) “Wow! It is so, so zingy. It reminds me of the first time I licked a battery … you know, it has that special sizzle!” No. I don’t. And I have no intention of finding out, ahem. Footnote II: The magic sindambi, now officially named Magic Zindambi — to honor the life-giving Zambezi River — was an equal hit with Chris and me. Yomar’s formula turned out to be an intense syrup, crafted out of the flowers, leaves and stems of the indigenous rosella plant, diluted in sparkling water. Cheers! Yomar’s Magic Zindambi made from flowers, leaves and stems of the rosella plant. Annabel! Your blogs are such a pleasure to read – and the blend of Africa is magic for us far away bush souls. Thank you for your sweet comment, Dee. Please let me know how your dinner turned out. Being the other side of the world I am wondering if you are sitting down to eat now? Hi Annabel. Home in Sydney now. 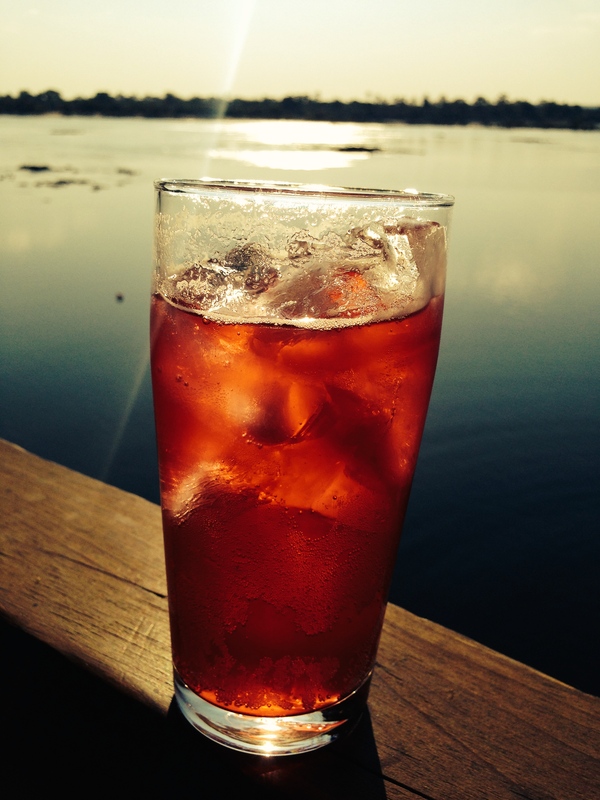 Reading your blog with the beautiful photos, recipes & stories is like reading a good book. I think you could create a lovely cook book that is different from all the others. Love it – am going to introduce your blog to “travelling hungry girl” based here in Naples!! Oh wow! Thank you, Georgie … how kind! I’m wondering if Travelling Hungry Girl travels all around the world, or just around your neck of the woods? I believe I just read the finest and funniest line of the week in the worldwide blogosphere….. “A muchingachinga fruit, in comparison, is like one of those envied sirens: too many curves clothed in bombshell red.” Be careful, Annabel, you might become rich and famous writing with such style. Bravo!